The market square in Krakow is one of the largest markets in Europe. The main function of the Market Square was commerce. After the city was destroyed by the Mongol invasion in 1241, the Main Square was rebuilt in 1257 and its commercial role expanded with the Magdeburg rights location of the city by the prince of Kraków, Bolesław V the Chaste. The Main Square was designed in its current state with each side repeating a pattern of three, evenly spaced streets set at right angles to the square. The exception is Grodzka Street which is much older and connects the Main Square with the Wawel Castle. Originally the square was filled with low market stalls and administrative buildings and had a ring road running around it. Today the market is packed with tourists and people selling tours. The Square is lively and crowded year-round. Like many other old town squares, Main Market Square in Kraków is known for its large population of Rock Pigeons, florist stalls and horse-drawn carriages. 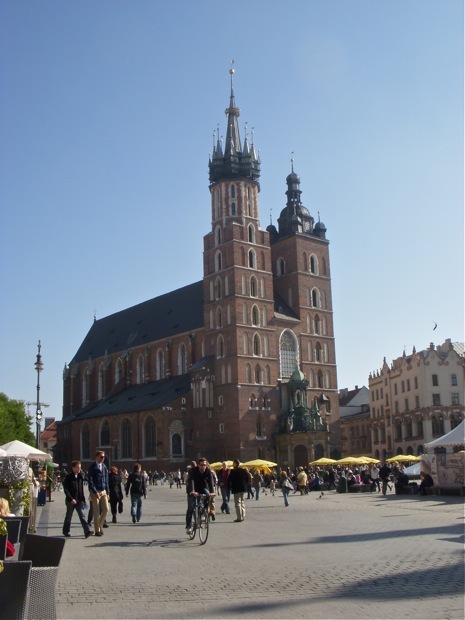 The culture of Kraków has a rich tradition and the Main Square is a popular place for public events and festivities The cafes and restaurants are over priced offering the tourist syndrome. However, just off of the square charming coffee cafes and small local restaurants can be found. The atmosphere changes drastically only one block from the main street and market square in Krakow. Quick Update: Today I am in Warsaw after visiting Lublin. I toured Auschwitz-Birkenau last Thursday and will have a post up soon. I departed Krakow on Monday to Lublin primarily to visit the concentration camp of Majdanek which is well worth a visit. I only stayed one night because there really was not any budget hotels in Lublin, but Lublin is a nice town in itself with a nice charming old town and castle. I will stay in Warsaw for a few days and then maybe visit Lodz on the way to Worclaw.